The weather conditions under which the attempts were made were ideal, there being just sufficient breeze to take the glassiness off the water, so assisting the takeoff. Temperature was suitable, and the air was free from bumps. After the successful attempt a banquet was held in the Officers’ Mess at Desenzano in Agello’s honour. 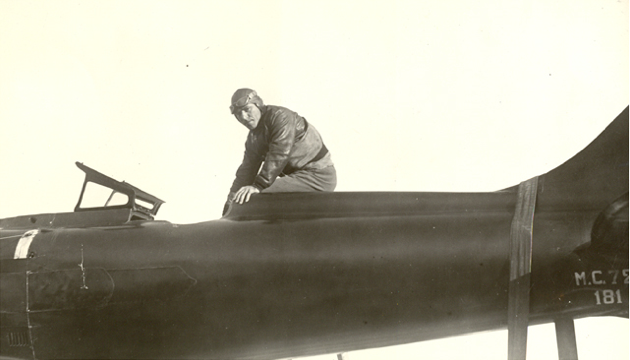 The speeds were announced, and Col. Bernasconi, who is in command of the High-speed Flight, stated that Signor Mussolini had honoured Warrant-Officer Agello by promoting him to a full lieutenant. 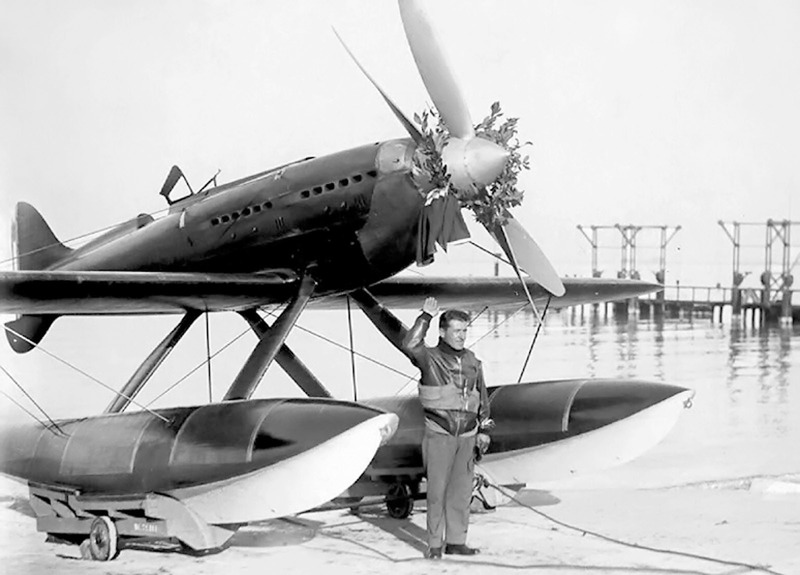 Only a few modifications had been made to the Macchi-Castoldi since the previous attempt, chief among them being the substitution of wooden floats for the metal ones previously used. As is well known. the most interesting feature of the machine is the extremely unconventional power-unit, the Fiat A.S.6. The problem of frontal area for such a powerful unit as was specified was solved by placing the twenty-four cylinders (totalling in capacity over fifty litres) in two rows, forming a 60 deg. “vee,” and further, arranging them in two mechanically independent groups. Each group has its own crank shaft, but a single crank case is used for both. The crank shafts, which rotate in opposite directions, are coupled in the centre by spur-gear reduction units, which drive two airscrew shafts. One of these shafts is hollow, and the other operates within it. The two shafts run forward through the “vee” of the front unit, and each carries an airscrew; so that there are two of the latter, close together, but revolving in opposite directions. Each engine unit has independent camshafts (two per engine), water pump and dual Marelli magnetos, but a common induction system is used, an eight-jet carburetter being mounted behind the rear unit and mixture being drawn from it passed to the cylinders by a supercharger geared up to 20,000 r.p.m. An interesting point is that this supercharger absorbs 200 h.p., and, since it is driven by the rear engine, the blades of the front airscrew (which the rear engine drives) are given different inclination to correct for the slight difference in power. The power units develop 3,000 h.p. at 3,200 r.p.m., and weighs 2,045lb., giving a weight per h.p. of 0.706lb. The all-up weight of the machine, with pilot and full tanks, is 6,670lb. British equipment figured in the success, for Castrol oil and K.L.G. plugs were used. — FLIGHT, The Aircraft Engineer and Airships, No. 1349, Vol. XXVI, November 1, 1934, at Page 1152. 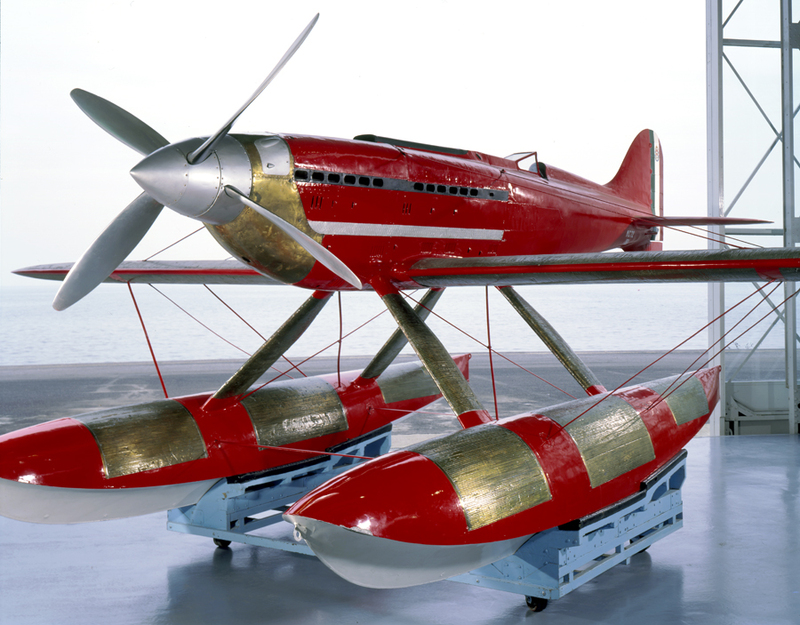 The Macchi-Castoldi M.C.72 was designed by Mario Castoldi for Aeronautica Macchi. It was a single-place, single-engine, low-wing monoplane float plane constructed of wood and metal. It was 8.32 meters (27 feet, 3.5 inches) long with a wingspan of 9.48 meters (31 feet, 1.25 inches) and height of 3.30 meters (10.83 feet). The M.C.72 had an empty weight of 2,505 kilograms (5,512 pounds), loaded weight of 2,907 kilograms (6,409 pounds) and maximum takeoff weight of 3,031 kilograms (6,669 pounds). It was powered by a 50.256 liter (3,067 cubic inch) liquid-cooled, supercharged Fiat S.p.A. AS.6 24-cylinder 60° dual overhead cam (DOHC) V-24 engine with 4 valves per cylinder. The engine produced 3,100 horsepower at 3,300 r.p.m. 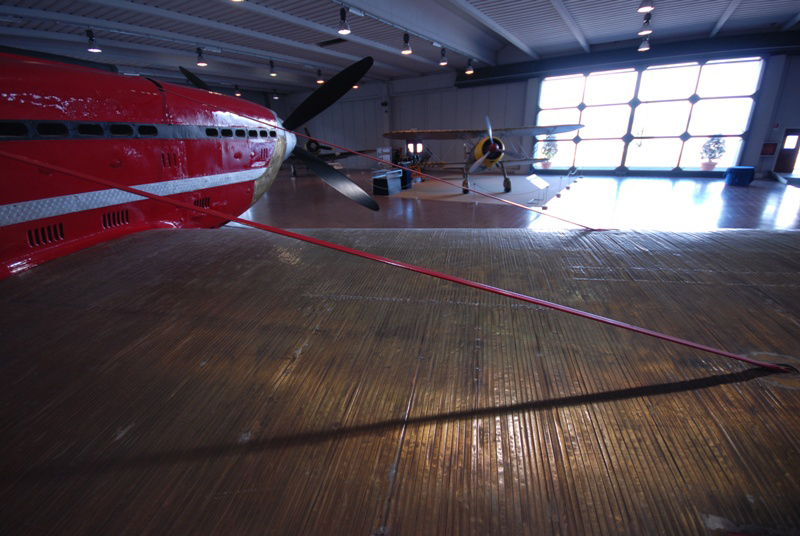 and drove two counter-rotating metal two-bladed fixed pitch propellers with a diameter of 8 feet (2.56 meters). The counter-rotating blades cancelled the torque effect of the engine. Surface radiators were placed on top of each wing and surface oil coolers on the floats. 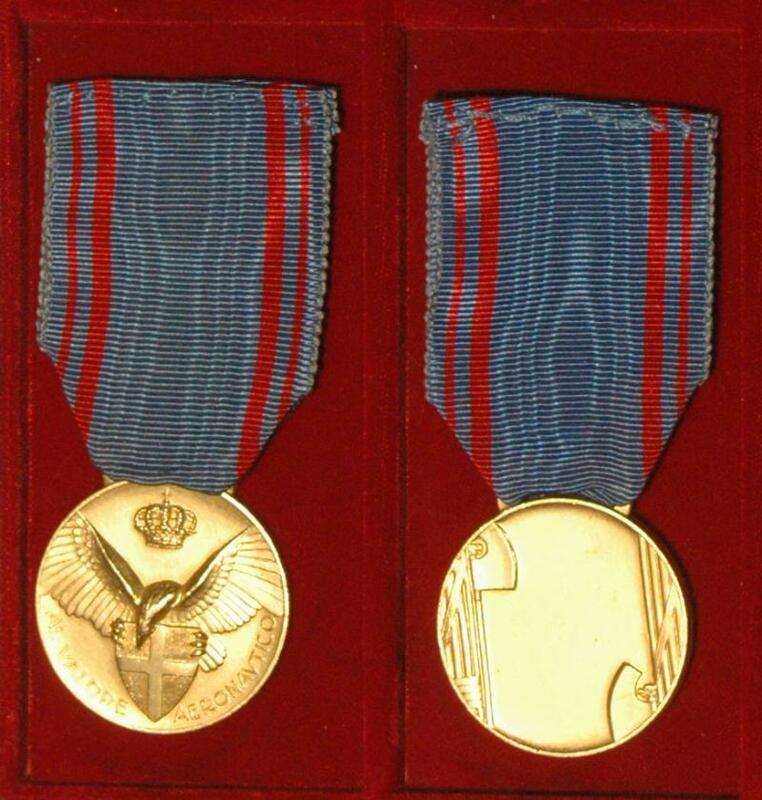 The Henry de la Vaulx Medal. 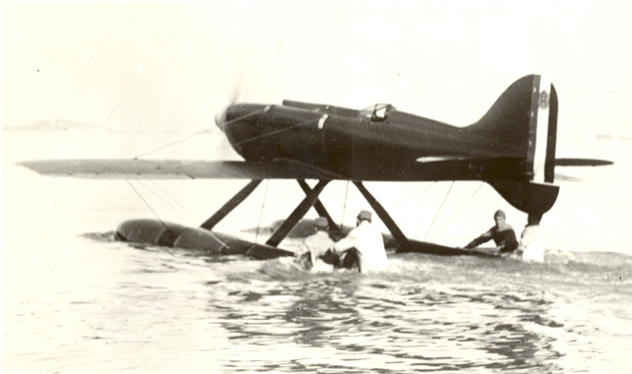 Five Macchi M.C.72 float planes had been built for the 1931 Schneider Trophy race, but problems with the Fiat AS.6 engine, which was essentially two AS.5 V-12s assembled back-to-back, prevented them from competing. 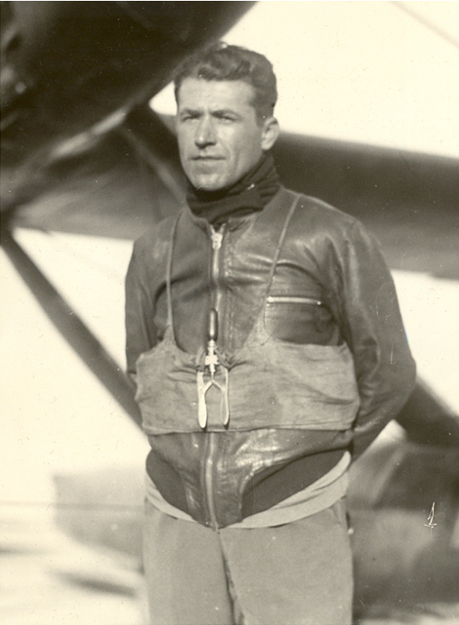 Four test pilots, including Francesco Agello, had been selected to fly the airplanes for speed record attempts. Two were killed while testing the M.C.72, and the third died when another airplane crashed. 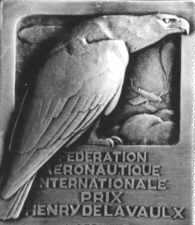 The cause of the accidents were explosions within the engines’ intake tract. Though they ran perfectly on test stands, in flight, they began to backfire, then explode. It was discovered by Rod Banks, a British engineer who had been called in to develop a special high-octane fuel, that the Fiat engineers had overlooked the ram effect of the 400 mile per hour slipstream. This caused the fuel mixture to become too lean, resulting in predetonation and backfiring. A modification was made to the intake and the problem was resolved. Captain Agello was killed in a mid-air collision, 26 November 1942, while testing a Macchi C.202 Fogore fighter.